With its history of violence against the Chinese people, any talk of correcting past miscarriages by the Chinese Communist Party should be taken with a large grain of salt—unless the issue is raised in the most unusual of circumstances. The Chinese regime often deals in coded, symbolic communication in Party propaganda and announcements. The timing, substance, and location of a recent meeting on the righting of wrongs in the Chinese judicial system by a powerful Party legal and security organ may hint at the overturning of the persecution of Falun Gong. Early morning on July 20, state mouthpiece Xinhua reported that the Central Political and Legal Affairs Commission (PLAC)—the secretive Party organ that controls the entire security apparatus—held a national level meeting on promoting judicial reform in Changchun, a city in the northeastern province of Jilin, from July 18 to July 19. Meng Jianzhu, the head of the PLAC, stressed at the meeting that the judiciary must be held accountable for miscarriages of justice, “especially in cases where torture is used to extract confessions, reprisal cases, and the bending of the law to favor one’s relatives or associates,” according to a report by Chinese financial magazine Caixin. The PLAC first raised the issue of correcting cases of injustice by the judicial system in August 2013. 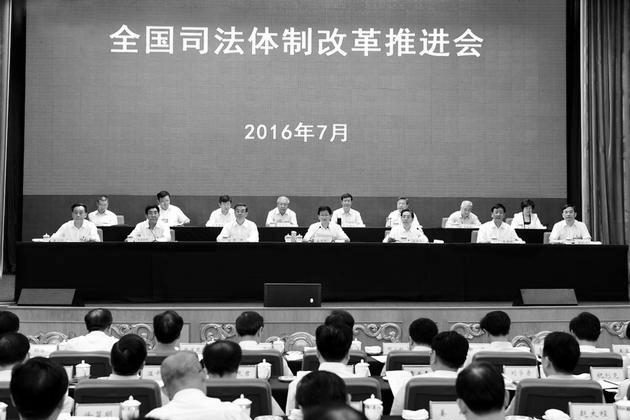 The following year, Meng chaired a meeting to discuss pilot judicial reforms in Shanghai on July 23 and 24. At a meeting held in the State Council Information Office in Beijing on September 2015, the regime’s top prosecuting body found that the use of torture to extract confessions formed the bulk of unjust cases in the regime. On July 20, 1999, former Party leader Jiang Zemin ordered the regime’s security and legal apparatus to suppress Falun Gong, a popular Chinese spiritual discipline. The campaign constitutes probably the largest sustained security mobilization and political campaign in the history of the People’s Republic of China, resulting in a vast death toll and tens of millions of citizens who are treated as enemies. The fact that the PLAC dedicated a meeting to making up for past injustices, in particular before such a sensitive date, is also noteworthy. Under former PLAC leaders Luo Gan and Zhou Yongkang, the regime’s security apparatus meted out precisely the sort of miscarriages of justice described by incumbent security head Meng Jianzhu. Practitioners of Falun Gong were forced to renounce Falun Gong. When the practitioners refused, they were brutally tortured—over 4,000 have been killed this way, and hundreds of thousands were held in some form of detention where they faced such abuses, according to incomplete figures from Minghui.org, a clearinghouse for first-hand information about the persecution. Because of the difficulty of getting information out of China, the number killed from torture is believed to be much higher. When human rights lawyers and Falun Gong practitioners contested the legality of the persecution, they met with reprisals from the regime’s security forces. Police and prison guards would apply similar methods of torture they used on practitioners on rights lawyers like Gao Zhisheng, Tang Jitian, and Wang Yonghang. Officers from the 610 Office, the extralegal Party organization created by Jiang Zemin to oversee the persecution, had on numerous occasions intervened in judicial proceedings to secure the formal sentencing of Falun Gong practitioners. The location was significant, if the meeting was meant to signal something about Falun Gong. It was held in Changchun—a rustbelt city in the northeast that happens to be the birthplace of Falun Gong and its founder, Mr. Li Hongzhi. The multiple coinciding elements associated with the meeting about “judicial reform”—timing, substance, location, and responsible Party organ—don’t seem to be mere chance. It is certain that high-level Party officials are all familiar with the sensitive date, as well as the close relationship between the location and Falun Gong. Finally, the connotations in Chinese politics of promises to rectify “unjust, false, and wrong charges,” (yuanjiacuoan) are redolent of the political rehabilitation of many wrongly persecuted Chinese following the Cultural Revolution. If this is an instance of the Party leadership subtly communicating about a potential shift in the policy on Falun Gong, it would not be the first time. Before this year’s anniversary of a peaceful appeal in Beijing by Falun Gong practitioners on April 25, 1999, Xi announced that it was in the regime’s interests to take a more charitable stance on petitions from the masses. Four top security officials who oversaw particularly violent torturing of Falun Gong practitioners were purged. And Xi chaired a high-level meeting on religion where he talked about “guiding” religion instead of dominating it, as was the policy of his predecessor Jiang Zemin. No substantive policy changes in any of these areas have yet been registered—but the series of unusual public signals makes it a distinct possibility.